[tps_footer]Amitabh Bachchan loves his fans and he is known for interacting with them whenever he is free. He is the megastar of Bollywood and loved by millions, people adore and respect him. And so he pays equal respect for his fans. But as gentle and humble Big B always has been. He just shut the mouth of every newsmakers who are alleging him of not attending to his fans and disrespecting them. 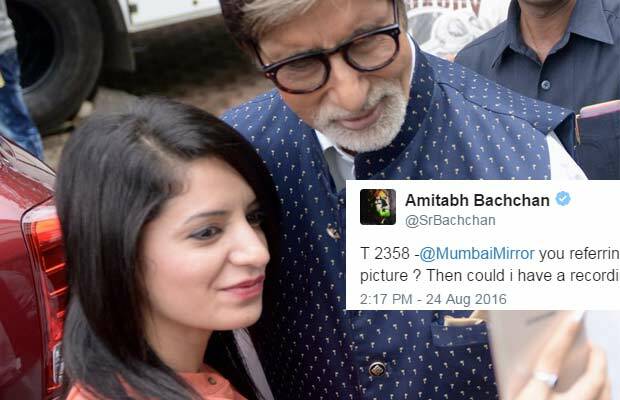 Few hours later, Big B shared an image where he took a selfie with the same girl. Amitabh Bachchan in the post also said that he wanted to change his shoot attire and get on his regular clothes before clicking a picture. He gave us a proof that he took a picture with that fan and that he wanted to get out of his shoot costume. We all are aware that every Sunday it has been a tradition that Amitabh comes in his balcony to wave a hello to his fans waiting for him in his bungalow Jalsa, so there is no doubt Amitabh Bachchan will disrespect his fans. Previous articleRevealed: The Real Reason Why Colors Is Airing Kapil Sharma’s Old Shows! Next articleRajkumar Hirani Reveals Something Very Exciting About Aamir Khan’s 3 Idiots Sequel!